While writing and running the program there might be three types of error. Compile Time Error:-This error generally occurs because of syntax error. Run Time Error(Exception):- This error occurs when application is running but some logic is failed according to CLR. Logical Error:-Program is compile and running successfully but we are not getting the expected output due to not written correct logic. Exception Handling:-In Exception handling we provide an alternate path that if some error occurs at run time instead of halting the program.some alternate path of code executed.There are some keywords which is used in exception handling. Try:- We put those codes to try block which may give some error at the run time. Catch:-A catch block is used for catch the Exception of try block codes if any.We can use multiple catch block for handling the Exception of one try block. Throw:-When any error is found in program then this keyword is used to throw the Exception to other block(method). Finally:-Finally block codes are always executed if any Exception is throw or not throw.This set of statement is always executed. There are some exception classes which is used for handling the Exception.All the Exception classes is derived from the two main classes. There are some steps to run the Exception handling programs. Step :2 Now Run the Program(press F5). Note:-This is example of predefined Exception class. 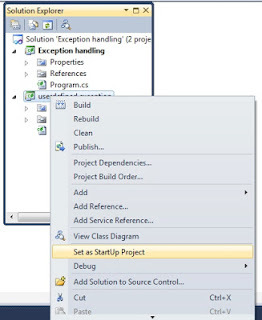 User defined Exception classes are derived from the Application Exception class.Which is shown in example which is given below:- follow same steps as above. Note :-On the basis of this example you will create your own Exception which you want to show to your users. 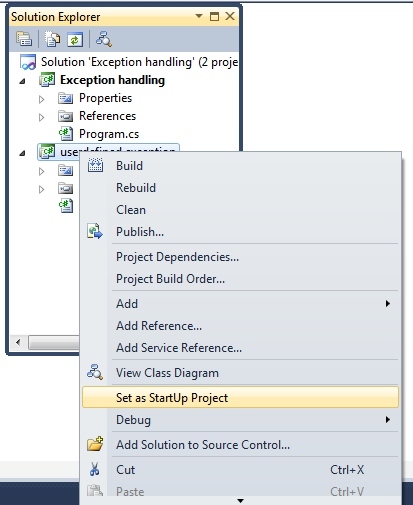 If you want to run any specific project in visual studio then ,click Solution Explorer--> Right click on particular Project-->Set as Start UP Project. Basic elements are used for compiling the c# code. Click below for download whole application.Please share these post to another friends. C# Exception handling uses the try, catch, and finally keywords to attempt actions that may not succeed, to handle failures, and to clean up resources afterwards.